This is my savory side! I enjoy combining sweet and savory to get a balance of flavors, as with this dish. You can’t go wrong with a little maple syrup to be a little more indulgent on turkey day. Because it honestly just felt right, always go with your gut instinct on these kinds of things. As my neighbor suggested, you could make this in a crock pot, cook until the yams are tender and mash away. So easy, and so yummy! This is the second recipe I am doing for The Ultimate Oregon Thanksgiving Recipe Roundup. Where Missy Maki from Missy Maki Cooks, and Simple Kitchen with Missy Maki on KPAM 860 Sunday from nine to eleven am asked a few Portland bloggers to get together and share tips and tricks to make your holidays easier and tastier. So that is exactly what we did! I made this dish and and Apple Cardamom Pie with a super tutorial on pie makings. Missy has been very busy making sure we had super coverage for this event. We were featured on the front page of Food Day Oregonian newspaper about the recipes and radio show! I wanted to make these super simple, easy and delicious. Keeping some dishes simple for the holidays are what helps ease the stress and allows you to enjoy time with the family and guests! This is a great dish to make a day or two in advance to ease your holiday as well. 1. Place the yams, butter, cream, maple syrup (reserve drizzle amount), thyme, salt, and pepper in a Dutch oven or heavy bottom pot, or crock pot. Cook over medium heat for 30-40 minutes or until yams are very tender. 2. 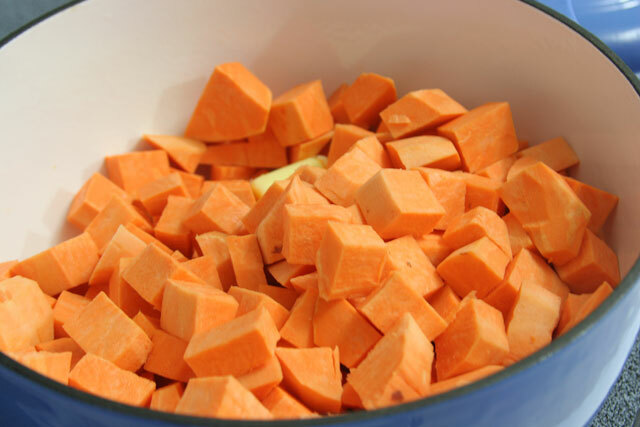 Take a potato masher and mash the yams until smooth or a consistency you enjoy. 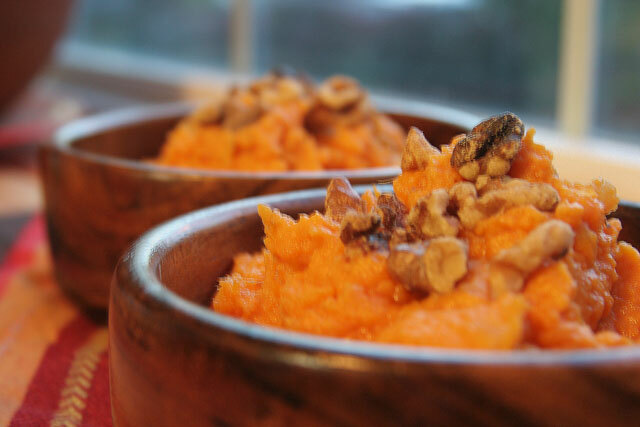 To serve, drizzle the 1 tablespoon of maple syrup over hot yams, and top with the 1 cup of toasted walnuts.